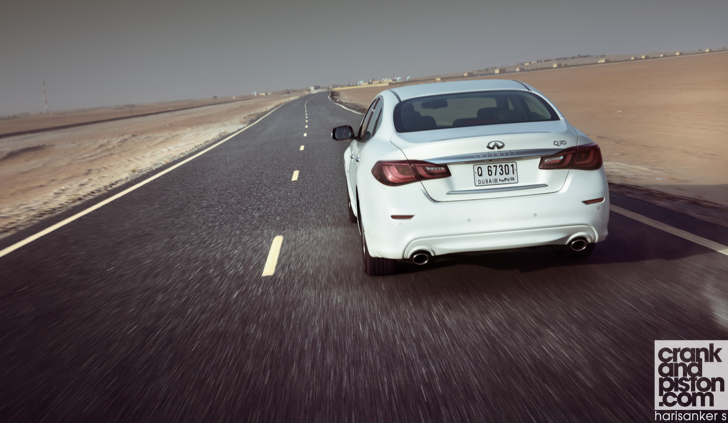 Infiniti‘s answer to the Mercedes E-Class has hit the Middle East. But does a refresh really cut it? I am normally quite critical of Infiniti, which is surprising since, in essence, I actually quite like their cars. I like the QX70 (we wave farewell to our long term ‘S’ HERE), I loved the Q60’s sense of style and the looks of its convertible alter-ego. 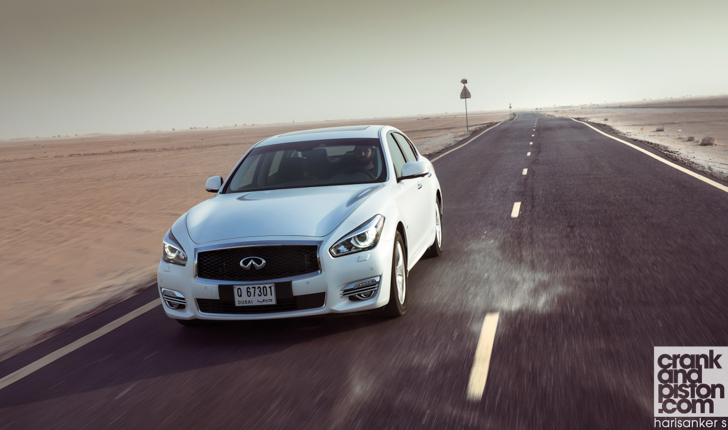 I find the Q50 compelling with the amount of driver assistance technology at work. And today’s specimen, the Q70, I find truly beautiful. Indeed, looking at Infiniti’s collection as a whole, one really cannot praise design director Alfonso Albaisa highly enough for creating such a striking style. My problem with Infiniti though stems from what I call ‘the epitome of wishful thinking’. See, I understand that marketing needs to both highlight the pros and instill a sense of lifestyle associated with a product, to the point that – if the job is done properly – prospective customers simply cannot live without one. In the premium mid-sized saloon segment however, this can be much easier said than done. True, the freshly facelifted Q70 strikes me as essentially beautiful – an angle Infiniti is pressing strongly – with its aggressively muscular front end and striking, aerodynamic profile. The front splitter looks like it’s been ripped straight from a Formula 1 car, and the 20in alloy wheels are a work of art in themselves. On the looks alone therefore, the ‘new’ Q70 fits the segment snugly. Similar story on the inside too? Yep. Long-necked people such as myself can have trouble fitting in the back of, say, a BMW 5 Series. But given the room and comfort in the Q70, this is no issue at all. In fact, there is space to spare pretty much everywhere, with generous head and legroom for both front and rear passengers (plus driver). The 500-litre bootspace should also prove more than sufficient for those multiple golfbags marketing teams seem fascinated with promoting. So, it’s got the looks and handles nicely. Any drawbacks? If there is one criticism to make, it’s that – comfortable as it is – there doesn’t appear to be a huge amount of change from the previous incarnation Q70. And when you consider that said saloon is going up against segment-rivals Mercedes and BMW with the E-Class and 5 Series respectively, that is somewhat disappointing. 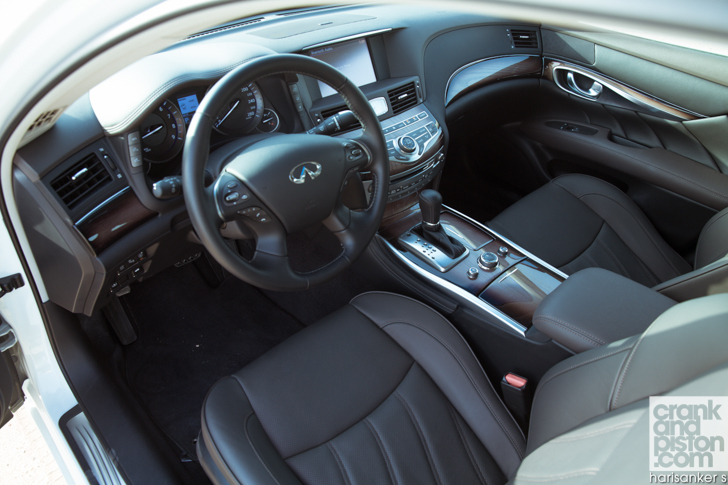 Of course at $46,000, the Infiniti is cheaper than the BMW and Mercedes, and even Lexus’ GS 350 (this premium saloon is almost within pricing range of a Kia Quoris), albeit at the expense of features and fittings that come as stock with its Germanic and Japanese rivals. And, indeed, the driving experience itself. The 3.7-litre V6 for instance is a competent little unit that sends 325bhp and 270lb ft of torque to the rear wheels. And yet for reasons that escape the data, the throttle still feels quite sluggish: put the engine in Eco mode for instance and you can forget about overtaking, since this will take longer than choosing a coffee at Starbucks. I realize Eco by its very nature is not the sprightliest of driving modes – and ‘performance’ is probably best reserved for the 410bhp 5.6-litre V8 model – but some middle ground wouldn’t go amiss. Similarly the brakes, though competent, lack feel, something that doesn’t offer a huge amount of confidence when you’re trying to bring 1795kg of saloon to a halt. On the plus side, though you’re unlikely to hustle the V6-powered Q70 through the turns, Infiniti has dialed in nicely-weighted steering and good feel for the front wheels. Weight transfer proves of little concern through the tighter turns either thanks to finely balanced suspension and minimal bodyroll. There’s plenty of visibility and the driving position is impressive, even if the seats themselves could use a little more lumbar support. You’d be surprised just how comfortable the whole experience can prove, even if the rather relaxed powertrain doesn’t make it the most exciting of drives. Probably not. 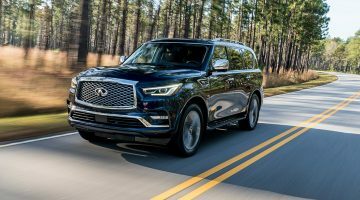 I realize of course that a refreshed model can bring with it only limited technological updates and cosmetic improvements, and in giving the Q70 a spot of polish and some updated tech, Infiniti has at least produced a civilized product that legitimately can undercut some of its key rivals. A multitude of driver assistance technologies and a design DNA that will surely represent the company for the foreseeable future at least stakes this claim even more. Against strong contenders like the BMW 5 Series and Mercedes E-Class though, I do still wonder if the Q70 has bitten off slightly more than it can chew, vague handling and a rather listless engine key black marks against models that, in their own way, have represented the thrill of driving for several generations and across numerous decades. There is potential though, one that – who knows – genuinely could take the fight to Munich in the years to come. Now that really is wishful thinking. 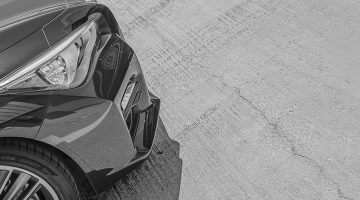 Next Article Carbon fibre wheels. The new must-have?